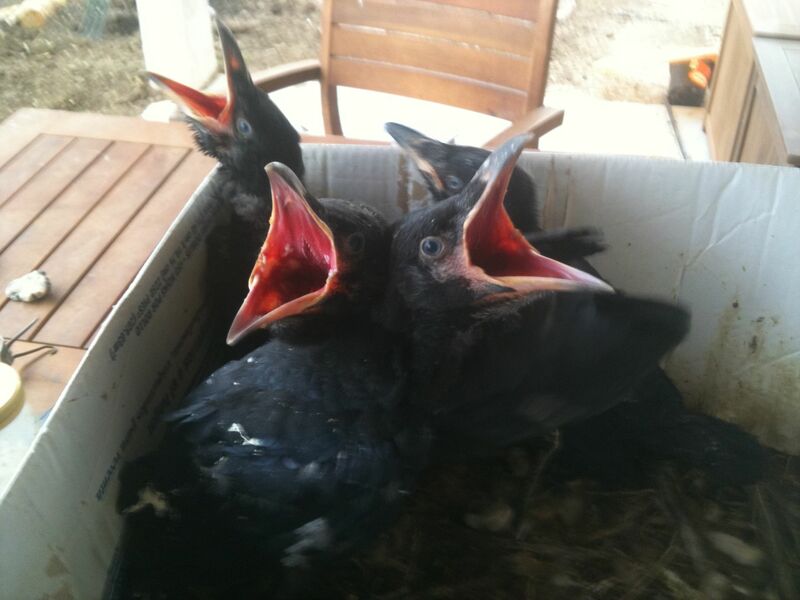 What do you do with a clutch of ravens? First order was to keep them alive. We left a message with Bernd Heinrich in Vermont. We called Raven Rescue only to discover that they’re a rafting company and have nothing to do with ravens. They promised to send t-shirts. We looked at Raven FAQ’s online. Folks had all sorts of questions. Can I teach my raven to speak if I slit it’s tongue? Can I train it? We just wanted to know what they eat. We settled on a mash of yeast bread and milk which they took to eagerly. They immediately took to us as feeders. And of course we gave them names. Distinct personalities warrant names. Poe is the most aloof, always sitting apart from the other three. More is the most hungry, thrusting out his narrow head and beak long after the others have stopped feeding. For is heavy set. Ever is the last one left. But it’s all nonsense. We’re their temporary caretakers, not their parents. Their parents are out there somewhere, undoubtedly looking for them, wondering what sort of strange alien abduction has taken place. They’re wild. And back to the world they must go. This entry was posted in Beings, Ravens and tagged Bernd Heinrich, Hopi, Ravens by Andrew Lewis. Bookmark the permalink.